In this session we continued our discussion of pricing multiples. Each multiple, we argued, has a driver and companion variable. We then moved on to application and how best to find comparable firms and control for differences. At this point, you have the tools you need to price just about any stock (or asset). Remember that you are paying to heed to the market, controlling for differences as much as you can and hoping that pricing divergences disappear over time. A cheap stock is one with a low PE, high growth, low risk and a high ROE and that becomes the foundation for screening for cheap stocks. If you want to read up more on screening, try this blog post. The post "TITLE" appeared first on Alpha Architect. Pricing caps are because today are going to play the role of pricing skeptic. So let's start with. Today's. Let me throw a few puzzles at you because it's going to build to what we're going to do today. So let's say I compute the PE ratios for Latin American countries. I do it for Brazil, Peru, Venezuela, Chile. And then I tell you you know what Venezuela looks really cheap right now. It's trading at a low multiple of earnings. What am I missing. Come on this is an easy one. It looks cheap. But why does it look cheap. It's crazy and incredibly risky. Interest rates are true at 5000. So in a sense there's a reason. So today when you talk about comparing ratios across countries and ways in which you can control for those differences because otherwise you can see what storytelling you can do whatever you wanted to do. That's gabled let's say the current P for the S&P 500 is about 20. So you're not that far from it. It's much higher than it's been in the last three four five decades. So I played the role of a market strategist or Robert Shiller. Whichever role you want to take on. 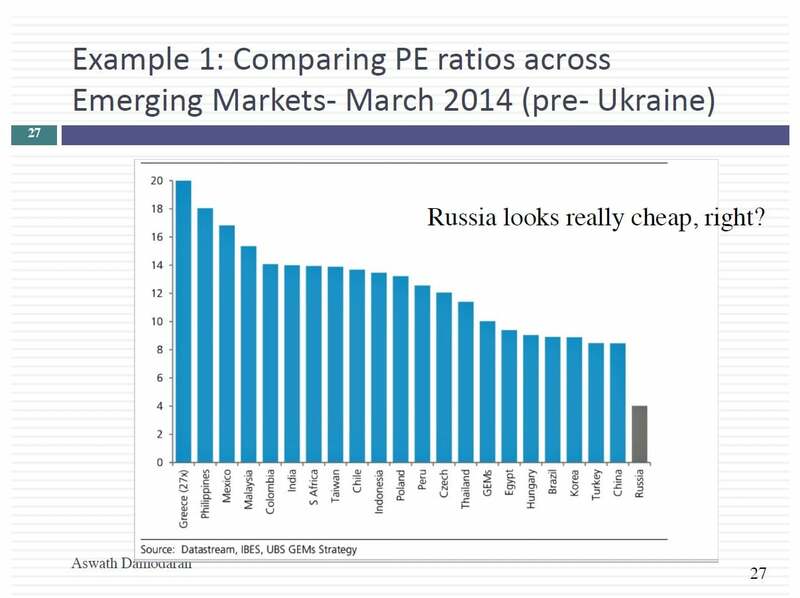 And I say you know what stocks are overvalued because the PE ratios today's higher. But the question I have is a more fundamental one. So ratios are higher. So there's no contesting that that's that's true but which of the following reasons could also explain ratios being higher. The risk free rate is at a historic low. Could that explain some of this low risk free rate. So we're going to try to make that connection. Could it be that the equity risk from today is higher than it's been historically. What does a higher equity screen do. It pushes down stock price it's cutting in the wrong direction even lower than it's been historically then maybe but higher not the return in equity has increased over the last couple years. Could that help. Where does high return equity allow you to do deliver the same growth with less reinvestment that's good to maybe higher return equity so a could be true. Could be true maybe expected earnings growth is likely to be higher now than it was historically. That could be you see where I'm going if you go back to fundamentals Yukon's is looking to Piira should they compare to his history without controlling for differences. Today again one of the things we're going to do is look at the PE ratio for the S&P 500 and once and for all face up to those people who believe it it's a bubble and say Is it really a bubble. Can we explain it using fundamentals. I'm going to give you a very simple statistical mechanism for control. And finally let's talk about two companies company has a ratio of 20 and an expected growth rate of 10 percent for the next five years. Company B as a ratio of 10 in an expected growth rate of 5 percent a year for the next five years this is today we're going to talk about this notion of a PEG ratio PEG ratio is somewhat some equity research analysts use which is to divide the PE ratio by the drogen.